Whether it’s a quick “grab & go” in a take out paper bag, a casual bite to eat with colleagues/friends or a hurried assembly from the fridge contents at home, the idea that your lunch can be making you fat may not resonate with your virtuous intentions… you could be making any one of these 6 lunch mistakes? Despite hearsay, lunch rather than breakfast can be considered the most important meal of the day. It is crucial that you fuel your body, so that you can meet your energy requirement during the day, when you are active, both physically and mentally. However, the choices you make at lunchtime can, not only play havoc with your energy balance during the day, but can also be making you fat. So if you’re looking to lose weight, perhaps you’re making one or some of these 6 lunch mistakes….? With our busy lives it is not always easy to allow time for meal preparation and it can seem that the only option is to rely on local food outlets to buy in a meal or snack. 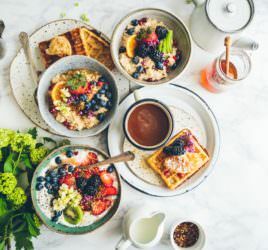 However, the disadvantage is that you do not have as much control over your meal choice and you are likely, particularly if you’re in a hurry, to be swayed by promotions and “Meal Deals” that sound appetizing and offer exceptional value for money. If you’re honest, they often contain items you don’t actually want to eat and probably wouldn’t choose if you were paying full price for each item individually. Typical meal deal items such as sandwiches, crisps, fizzy drinks/juices and chocolate bars will mean you consume more calories, sugars and fats than you intended and in the long run this will lead to weight gain.